Forget about Ellen DeGeneres’ all-star group selfie at the Oscars’ that went viral earlier on this year. 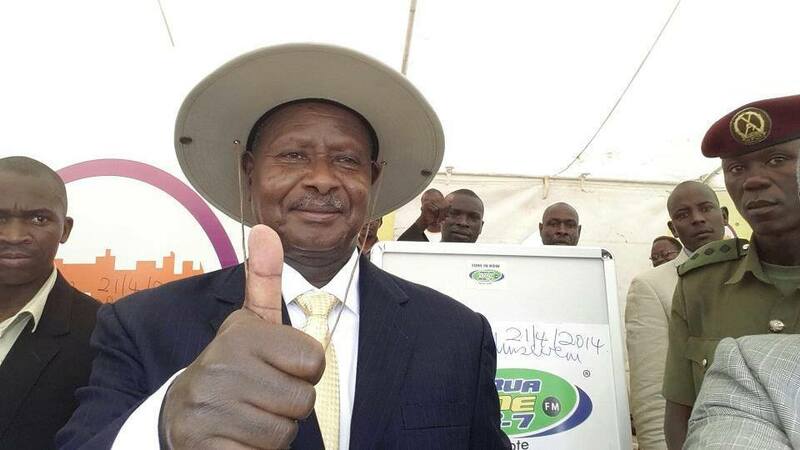 Uganda’s president Yoweri Museveni just took his first selfie. Armed with Samsung’s Galaxy Note 3, like Ellen’s, the president took a selfie with a subtly lit facial expression and a thumbs up sign with is his party’s –NRM– signature hand gesture. This was at the unveiling of the West Nile Cultural and Tourism Centre in Arua on Easter Monday. Apparently Ellen was cashed heavily by Samsung to take the said selfie. However, with the help of Vision Group’s MD Robert Kabushenga, it is close to impossible to imagine that that was another marketing gimmick by Samsung. In fact, the president is quite an old school guy for he doesn’t have a penchant for using fancy technology. The audience at the Transform Africa conference in Kigali had one of those “oh Lord, not again!” moments when Museveni digressed from the ICT theme topic and started talking about agriculture without attunement. He joins famous world leaders like Barrack Obama, David Cameron, the Pope amongst others who have been featured in selfies. The question of whether the president is falling for gizmos and new media is for another day, but for sure, he has fallen for the selfie.